Each week, the vital statistics offices of 122 cities across the United States report the total number of death certificates processed and the number of those for which pneumonia or influenza was listed as the underlying or contributing cause of death by age group. 7.3% of all deaths reported through the 122 Cities Mortality Reporting System were due to pneumonia and influenza in week 1. This percentage was just .1% above of what the CDC considers the epidemic threshold of 7.2% for that time of year. Forty-seven states reported widespread geographic influenza-like (ILI) activity; 2 states reported regional activity; the District of Columbia reported local activity; 1 state reported sporadic activity; Guam reported no influenza activity, and Puerto Rico and the U.S. Virgin Islands did not report. Twenty-four states and New York City experienced high ILI activity (Alabama, Colorado, Delaware, Georgia, Illinois, Iowa, Kansas, Louisiana, Michigan, Minnesota, Mississippi, Missouri, New Jersey, New Mexico, North Carolina, North Dakota, Oklahoma, Pennsylvania, Rhode Island, Tennessee, Texas, Utah, Virginia, and West Virginia). Sixteen states experienced moderate ILI activity (Arizona, Arkansas, Florida, Hawaii, Indiana, Maryland, Massachusetts, New Hampshire, New York, Ohio, Oregon, South Carolina, Vermont, Washington, Wisconsin, and Wyoming). Five states experienced low ILI activity (Alaska, Idaho, Nebraska, Nevada, and South Dakota). 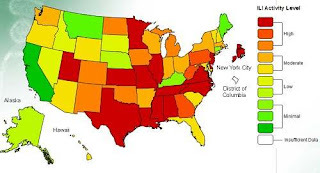 Five states experienced minimal ILI activity (California, Connecticut, Kentucky, Maine, and Montana). Data were insufficient to calculate an ILI activity level for the District of Columbia. 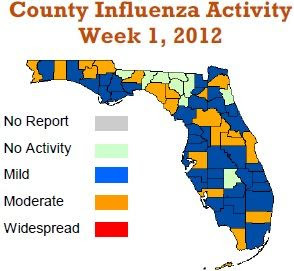 Currently, influenza and influenza-like illness activity is elevated in all regions of Florida. Influenza A was the most common flu type in Florida this flu season. Of the tests that have been influenza positive in the past five weeks, most have been positive for influenza A H3; the rest have been influenza B, with the exception of one 2009 H1N1 influenza A. All three of these are seasonal subtypes of influenza. There was one flu outbreak in Florida for week one which occurred in Orange County, Florida where 19 staff in a Central Florida nursing home reported ILI. One specimen tested rapid antigen* positive for influenza of unknown type. *Rapid antigen tests, commercially available, are considered less scientifically reliable than other tests. The CDC reports that the Florida Panhandle, Central Florida, and South Florida regions are showing higher than expected influenza-like illness activity in emergency room visits. Also, twenty counties across all regions of Florida reported moderate influenza activity for the week ending January 5, 2012 (week 1). Because of the statewide reports of increasing influenza and influenza-like illness activity, the Florida Department of Health is reporting widespread influenza activity to the CDC for week 1. The classification of a widespread activity level refers to the geographic spread of influenza - not its severity or intensity.